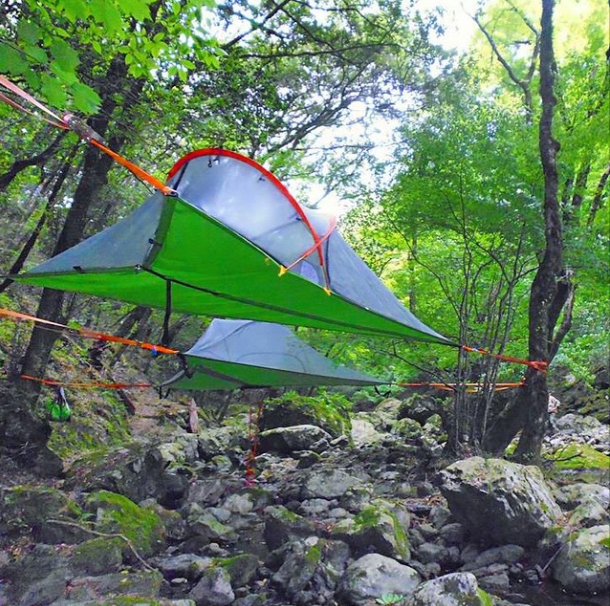 The Tentsile Stingray hanging tree tent is a fun and unique way to camp and see the outdoors. 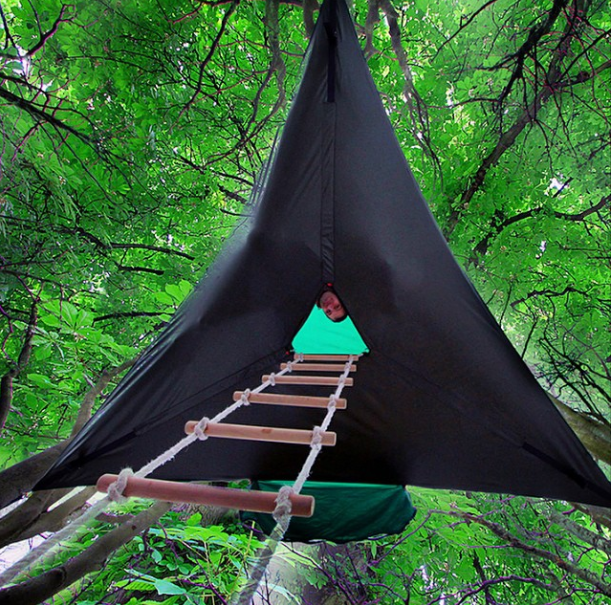 What if on your next camping trip, you could hang a tent in the trees, climb a ladder to get in and sleep above the ground? Pretty freaking cool right? Well, the Tentsile Stingray makes this possible. This tent is a mix between a tent, a hammock and a treehouse that have been combined to make an awesome “floating structure”. 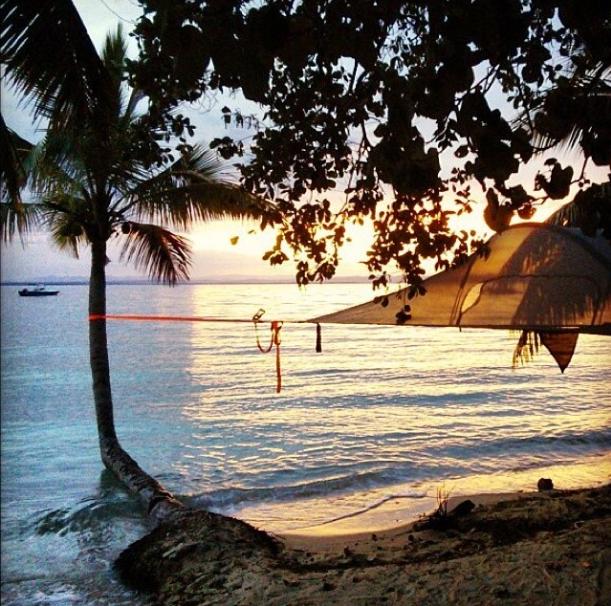 The Tentsile Stingray tent was designed to be set up easily and hold plenty of weight. Check out the entire Tentsile Stingray Hanging Tent Review here and get out and buy your own on the Tentsile website. 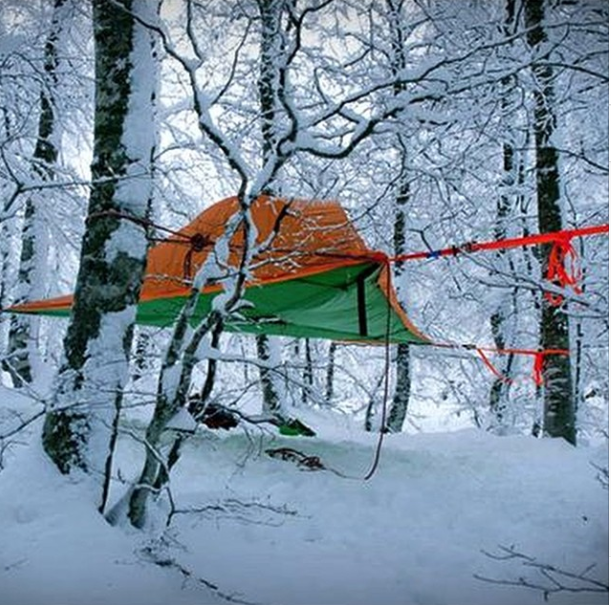 Three adults can sleep comfortably in the Tentsile Stingray hanging tree tent. Each has it’s own hammock compartment where they can lay comfortably and in their own space. The Tentsile Stingray is a 3 person tent that comes with a fly sheet and mesh roof. The tent has three anchor points that are attached to trees via ratchet straps that serve to hold it up in the air. You access the tent through a hole in the floor of the tent and can even use a rope ladder that is available from Tentsile. There is also another door on the side of the tent if you have it low enough to the ground. The Stingray is part hammock, part tent and allows you to easily sleep suspended above the ground. When we wrote the Tentsile Stingray Hanging Tree Tent review, we knew that it’d be a fun camping experience, but we never expected it to be this unique and comfortable. We were very wrong! You can access the Tentsile Stingray from the ground through an opening in the bottom of the tent that can drop down a rope ladder. Pretty fun right? You can easily sleep 3 adults in the Stingray hanging tent, but in reality you can probably fit more. The tent holds up to 880 pounds and since it’s above ground, we wouldn’t recommend trying to exceed that. The tent is pretty hefty and weighs 19 pounds. You need strong material to hold up bodies and that’s where the weight is from. This wouldn’t be a backpacking tent, but it’s great for normal uses and you’re definitely going to be the most interesting person in the campground. The materials that Tentsile used in the Stingray are of very high quality and with the proper gear, you’ll stay warm and dry in all conditions. The floor of this bad boy is made out of 240D polyester webbing. I don’t know exactly what that means, but it’s strong as hell. The fabric is reinforced with more than 20 meters of seatbelt webbing and we all know how strong seat belts are. The ratchet straps that hold up the tent are rated for more than 2.5 tons, so as long as you don’t put an elephant up there, you should be good. You can tell this is all high-quality when setting it up and sleeping in it. It should be for the price, around $675 right now, but still it’s good to see that they didn’t skimp on anything in this hanging tent. 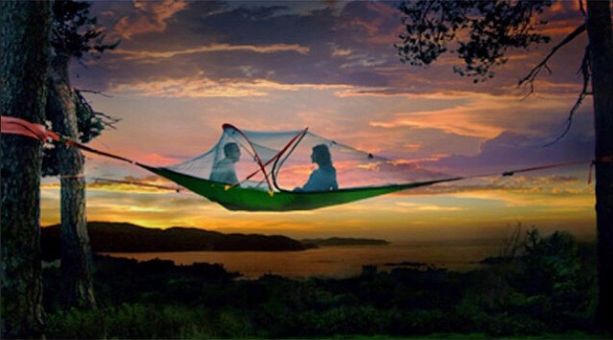 You’re going to experience camping in a whole new way if you try out the Stingray from Tentsile. This tent lets you have a completely unique camping experience. The Tentsile Stingray hanging tent is a very unique and cool way to camp. While the cost is higher than most traditional tents, you’re getting a product that is not only going to last virtually forever, but is something completely original. As you can see from the photos in this article, it gives you a whole new perspective on where you’re at and how you see the outdoors and that right there is priceless. You can order your Tentsile Stingray here for $675 on their website. See more awesome MorningMoss product and gear reviews and check out the latest hunting gear.